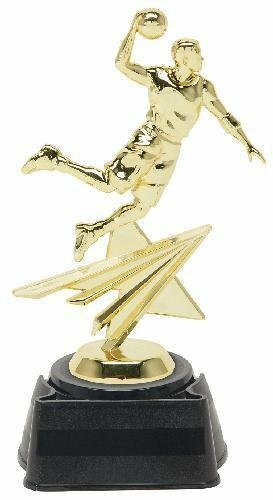 This fun little trophy features the Basketball Dude figure that has bendable arms and legs that can be posed. Attached to a black weighted plastic base with room to personalize, this is an award the recipient can have lots of fun with. If you're looking for a great little budget friendly trophy that you can award to all the kids on your team, this one is perfect. A full color basketball is framed in a black and gold ribbon design and mounted to a black weighted base that can be personalized for your event. 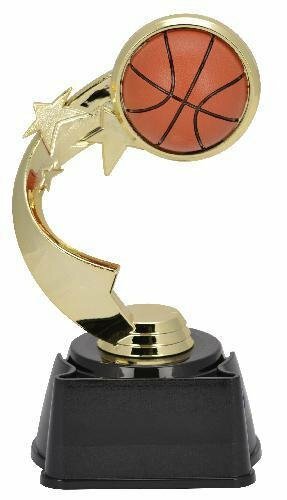 A full color basketball that spins on an axis is featured on this budget friendly trophy. Mounted to a white weighted base with room to personalize for your event, it's a fun little award to recognize your players for prowess on the basketball court. This trophy incorporates both traditional and modern design. The gold basketball and hoop are encircled in a gold wreath and embellished with rising stars. Sitting on a black and gold royal crown riser with a gold 3 star basketball at the side, it's all mounted to a black weighted base. Personalized for your team or event, it's an acknowledgement of achievement on the basket ball court that your players will be proud to receive.